Becca’s Aqua Luminous Perfecting Foundation comes in just 8 shades (with perhaps only 4 or 5 of those being FleshTone shades), with the darkest shade being ‘Deep Bronze’. HOWEVER, this luminous foundation DOES blend with a wider range of FleshTones than first impressions would have you believe. This foundation really fits right in with Becca’s theme of promoting and revealing your natural beauty, rather than covering it with product. It’s quite a dewy product, and somewhat more sheer than other similar products on the market. We therefore tend to lightly set it with powder (just in a few areas that are prone to shininess). 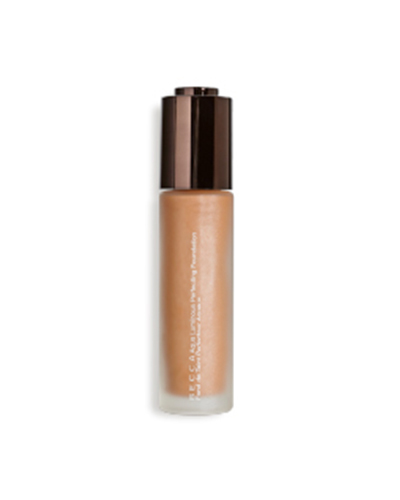 It definitely has a weightless feel, and gives you a fresh and dewy look all day. Prices start from $44USD.